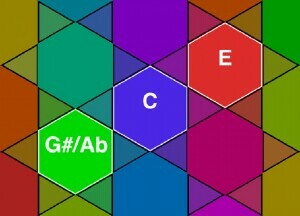 Harmonizer is an iPad application for exploring relationships between musical pitches. Harmonizer is free, available via iTunes. There isn't a lot of support for Harmonizer, but this page explains the basics. Q: How does the Harmonizer work? A: See How the Harmonizer Works, below. Q: Sometimes, when I'm playing something complicated, the Harmonizer stops playing. What's wrong? A: Most likely, you are inadvertently triggering one of the iPad's "Multitasking Gestures." You can see how these work here. If this is a big problem, the feature can be disabled globally (in Settings:General:Multitasking Gestures). We are looking into ways to have the feature interact more predictably with Harmonizer; if we figure something out, there will be another release. Q: What has changed in the latest version of the Harmonizer? A: See Version History, below. 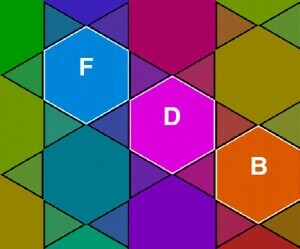 The pitches on the Harmonizer are arranged in a hexagonal matrix according to three interval types. When no tones are being played, the Harmonizer switches to "pitch detect mode." In this mode, the Harmonizer analyzes the sounds coming into it and tries to identify the predominant pitch. The identified pitch (or pitches, in the case of ambiguity) is highlighted on the display. It will respond to singing or single notes played on musical instruments. The tones produced by the Harmonizer are a special kind of sound known as Shepard Tones. Shepard Tones are unlike tones produced by most musical instruments in that they have a "pitch class" (e.g. 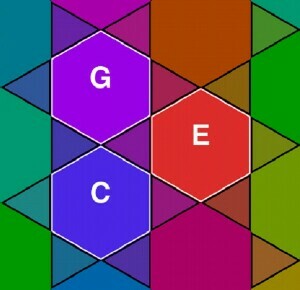 C, D, E), but not an octave (e.g. Middle C). Because of this, on the Harmonizer, all the pitches of a given pitch class sound the same. You can read more about Shepard Tones here. It is possible that children given an early introduction to the identities of musical pitches are more likely to develop absolute pitch (aka "perfect pitch"; see the Wikipedia article). 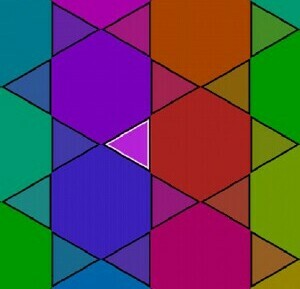 The colors serve to identify pitches before the acquisition of language. 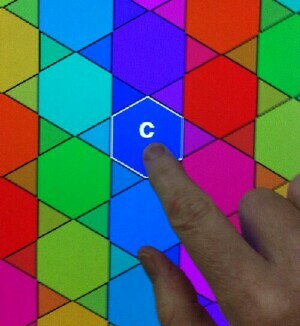 The touch interface is large enough that it can be controlled by children with rudimentary motor skills. Due to the orthogonal arrangement of pitches on the Harmonizer, chord progressions all have the same "shape" — regardless of transposition. When the iPad is inverted, the Harmonizer display will switch to upside-down portrait mode. If you are playing notes, these will also be "inverted" --- that is, reflected relative to C.
When inverted, major triads become minor and vice-versa (diminished and augmented triads remain the same). If you want to play the Harmonizer by feel, you can make a tactile overlay grid for it. Download this template, print it out (card stock works best), staple it face-up under a sheet of clear vinyl (you can get this at Tap Plastics), and cut it out with a box cutter or x-acto knife (here's the recommended order of cuts). I designed this so that a blind relative of mine could use it, but I find that it helps me play more accurately, too.